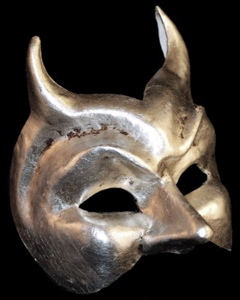 Be admired and adored in one of our Diavolo Silver - Authentic Hand Made Venetian Masks. Intricately crafted in Venice, Italy, with the highest attention to detail, our Diavolo masquerade masks include large eye cutouts under a furrowed brow, structured nose and pointed horns. Our artists brush the mask with attention-grabbing silver and add deeper tones throughout our Diavolo masquerade masks to create a true three-dimensional art piece. 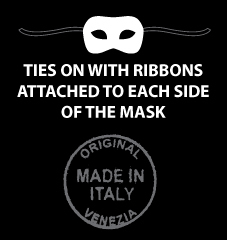 At the temples of our Venetian masks are satin ribbons to ensure your identity is obscured for the entire night. This mask is an exquisite choice for black tie costume events, masquerade balls or other costume party. Create your own unique masquerade costume by adding a black, silver, or red hooded cloak made by Venetian Mask Society.